There are so many different apple activities that you can do at home or in the classroom. 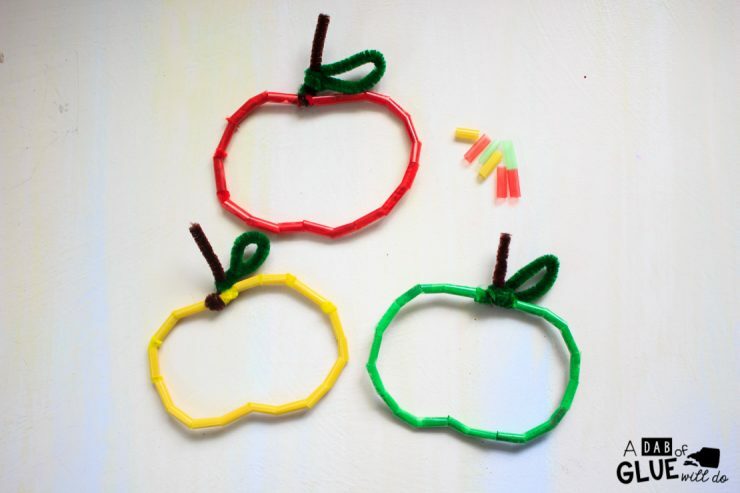 These Pipe Cleaner and Straw Apples are simple to make and great for practicing fine motor skills like cutting, lacing! They are also a great activity for a busy bag. They are a great addition to our Apple Literacy and Math Centers resource – perfect for language arts and math centers in preschool, pre-K, Kindergarten, and First Grade classrooms and packed full of inviting student activities. 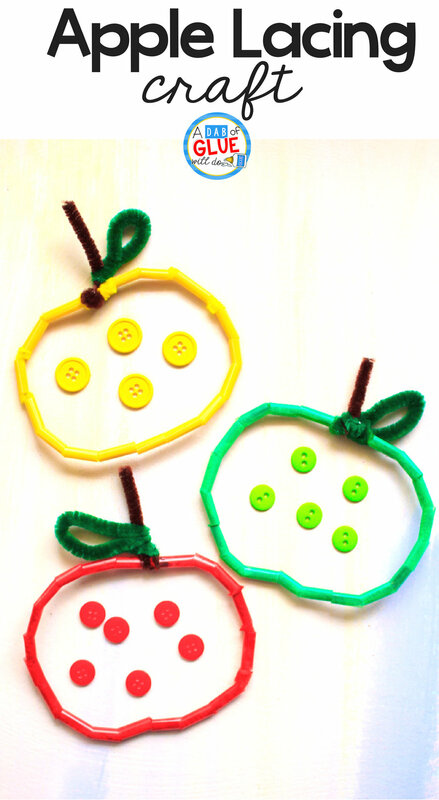 Be sure to check out more of our apple learning activities for early childhood! When doing this with a whole class, these would make an awesome Back-to-school craft to practice some cutting, lacing, color sorting & counting. 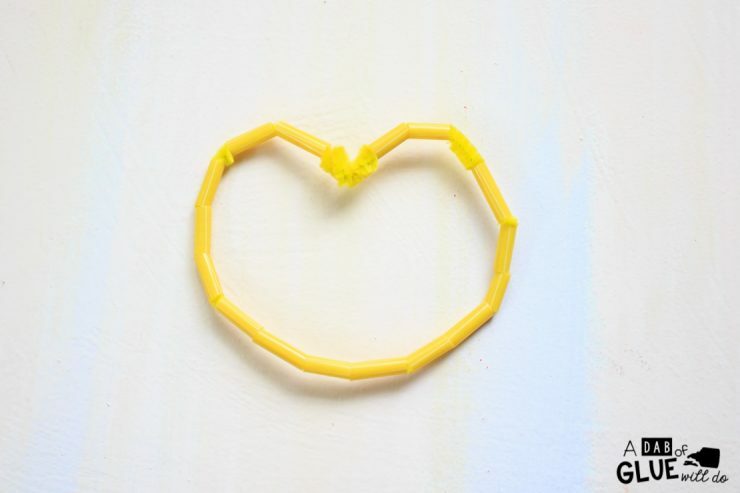 Start by getting the kids to cut small equal pieces of the straw. One straw is enough to make one apple. This helps them improve their scissor cutting skills. Older kids can make smaller quarter or half inch strips while the younger ones can make 1 inch long cuts. If you are pressed for time, kids can be given precut straw pieces. Take one long pipe cleaner and start lacing the straw pieces from one end till the pipe cleaner is covered. 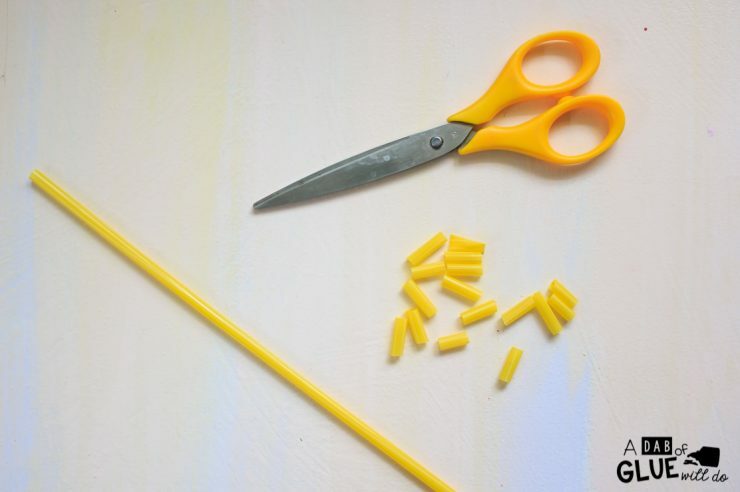 We used a yellow straw with the yellow pipe cleaner. 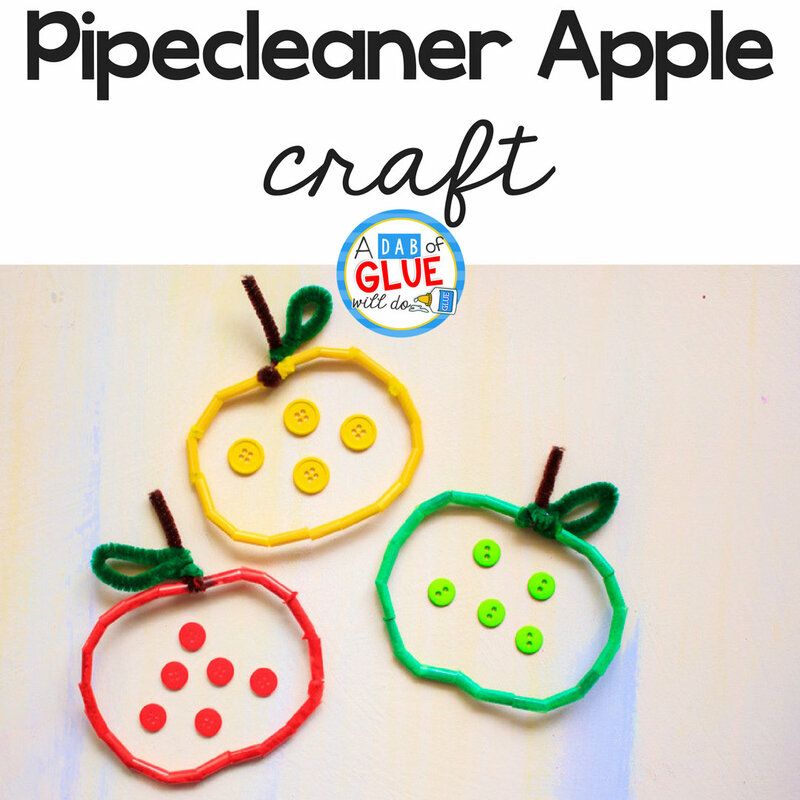 The pipe cleaners hold their shape and kids will be able to string them up with ease. This is a great activity for hand-eye coordination. 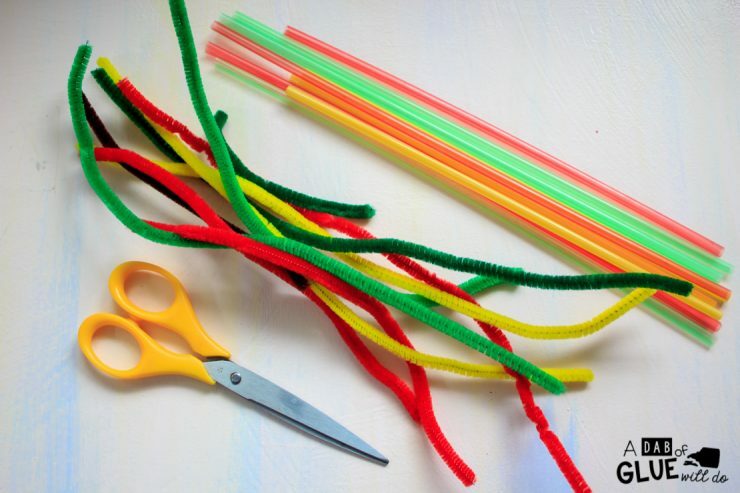 Tip: Ask the kids to lace the straws keeping the pipe cleaner horizontal at the desk. When my daughter held it upright, the straws fell off from the other end. Another way to prevent this is to twist one end into a knot so that the straw pieces don’t fall off. Next, twist the two ends together to form a circle. Bend the circle into an apple shape. Cut a brown and green piece of pipe cleaner into a half. These will be for the stem and leaf. 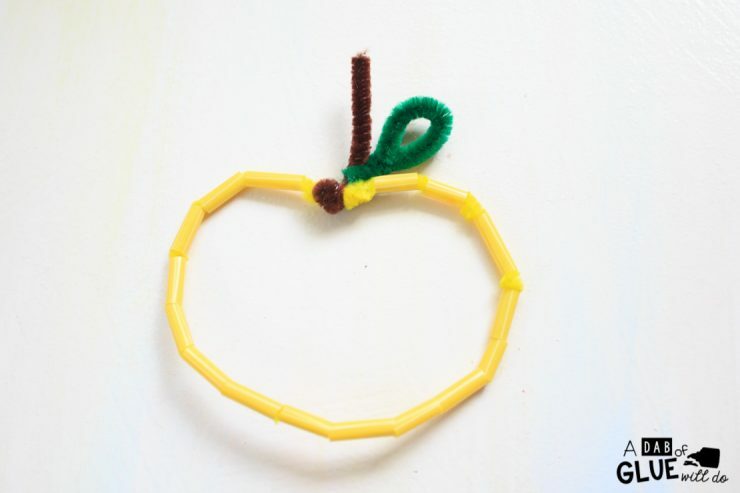 First, bend the brown pipe cleaner around the top of the apple shape. 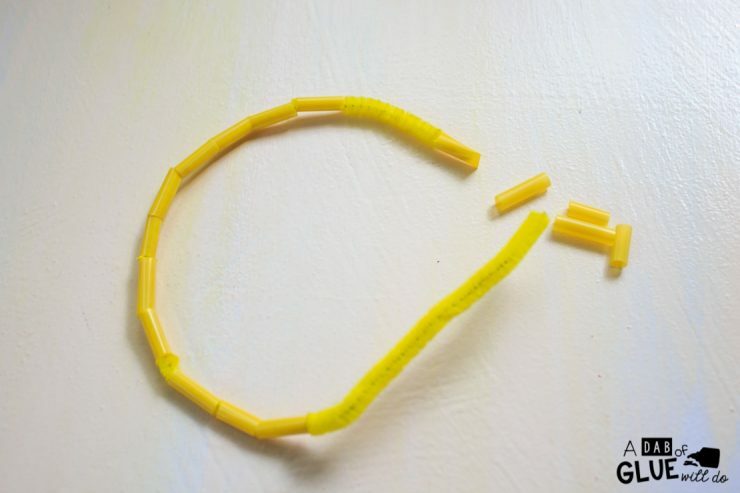 Push the sharp end of the pipe cleaner into the closest straw piece. Twist the brown securely to make the stem. Next, bend the green pipe cleaner around the brown stem and twist the two green ends together to form a leaf shape. 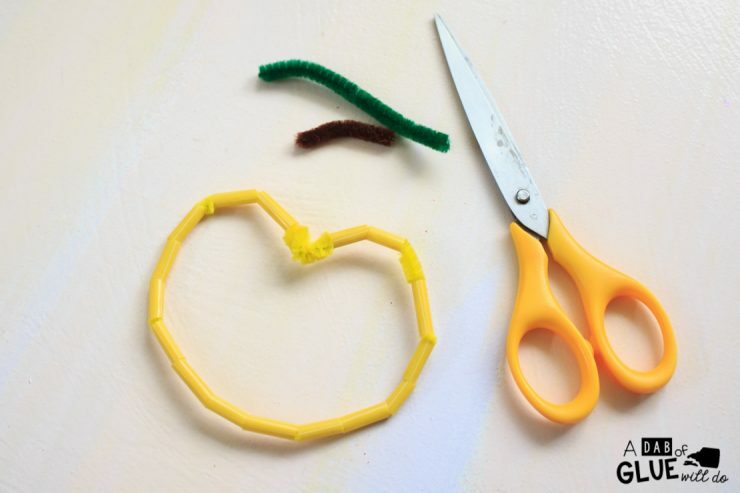 Your Pipe cleaner & Straw Apple Craft is ready. Make more apples. We made one yellow, one red & one green, but really, you could make them in any color to practice color recognition. Use colored buttons, pom poms or playdoh balls to practice early math counting.